From 2009 to 2018, the University of Minnesota Law School was the editorial home for Volumes 25-33 of the ABA Journal of Labor & Employment Law, a publication of the American Bar Association Labor and Employment Section. During this period, Faculty Co-Editors Professors Stephen F. Befort ’74 and Laura J. Cooper worked collaboratively with law student staff and editors to select and edit the articles of more than two hundred and fifty authors. With the retirement, and impending retirement, of the Faculty Co-Editors, the Journal’s editorial home moved to the St. Louis University School of Law in 2018. Authors seeking publication in the ABA Journal of Labor & Employment Law should submit manuscripts to the Journal’s current editors at abajlel@slu.edu. Read the guidelines for submission. For information on subscribing to the ABA Journal of Labor & Employment Law and purchasing back issues, please visit the Subscriptions page. 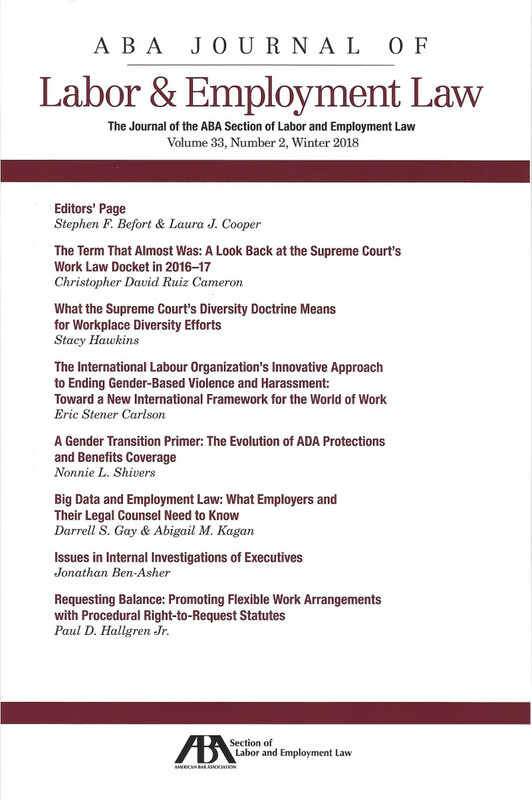 Members of the American Bar Association Section of Labor and Employment Law, and subscribers to the ABA Journal of Labor & Employment Law, can find indexes and obtain online access to published Journal articles (and those of its predecessor title, The Labor Lawyer), commencing with Volume 12 in the online Archive.